China may be an ancient civilization, but today (October 1), it celebrated its 64th birthday. It was on this day in 1949 that Chairman Mao stood atop the Gate of Heavenly Peace (Tiananmen) and declared the founding of The People’s Republic of China. The holiday is called National Day, and it marks the beginning of what has come to be known as “Golden Week.” Basically, the entire nation has a 7 day holiday. The logic behind the holiday is not so everyone can spend a week basking in the glories of Communism, but so they can spend money. 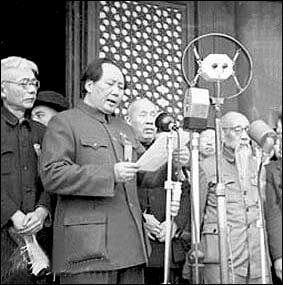 LONG LIVE CHAIRMAN MAO; NOW GET OUT THERE AND SHOP!! DOWN WITH CAPITALIST ROADERS….NO, WAIT…GET OUT THERE AND TRAVEL!! SERVE THE PEOPLE WITH ALL YOUR HEART AND SOUL….WHICH REMINDS US…DON’T FORGET TO PACK OUT THE RESTAURANTS!! At the end of the week, the government will announce how much money was pumped into the economy. No doubt it will be a glorious amount.